Iona Blog : A rosy guide to keeping sane througout Christmas craziness! A rosy guide to keeping sane througout Christmas craziness! So with only a few days until Christmas only 8 sleeps, I can't quite believe it! Today's post is a little pre-Christmas pamper post, working in retail at Christmas can be crazy to say the least, at the store where I work we had a queue out of the door on Saturday and sometimes you need to breathe and have some time to yourself, whether it's sitting down with a cup of tea and a magazine, blasting your favourite song and dancing like crazy or having a well earned pamper sesh' at this time of year it's important to take time out for you! My favourite soothing and nourishing products in winter are as would be expected from Lush, first up is BB Seaweed facemask, I love this gentle, nourishing face mask which leaves my skin feeling super soft! It's perfect for tired winter skin and with softening ingredients such as seaweed, honey and aloe Vera, rose to balance and millet flakes, ground almonds and kaolin to gently exfoliate and smooth. 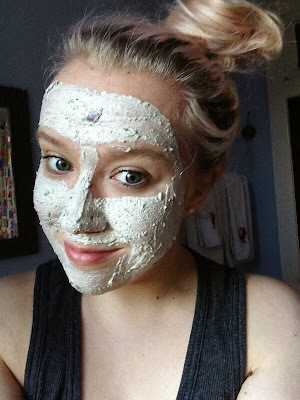 I've previously raved about my love of Mask of Magnaminty Lush's miracle worker for problem skin but when I'm looking for something a little gentler I reach for BB Seaweed a super caring fresh face mask! I borrowed this picture from my Lush Store's facebook, why not give us a wee like? You might be noticing a bit of a theme throughout this post, smelling of roses perhaps? To finish off this pamper sesh I'd add in a Rose Jam Bubbleroon (£3.50 each, though one usually lasts me a few baths, the smaller you crumble the bigger the bubbles!) one of the most luxurious bubble bars offered up by Lush. 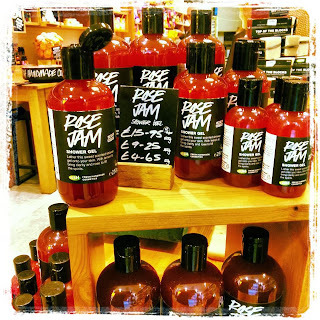 Rose Jam creates silky soft, sweet smelling bubbles, the ideal bath after a long tiring week! Personally I'd finish off with one of my favourite body butters King of Skin (£5.50 per bar) to ensure my skin is super soft, a fab naked product which gently buffs and smoothes the skin whilst moisturising and conditioning. King of Skin is also packed with Shea butter which is a natural humectant and draws in moisture to the skin. I'd love to hear what your go to products are for a distressing pamper session, I love relaxing rose scents to unwind and chill out. I'd also love to hear your tips on relaxing and keeping sane over the festive period! I'll be working lots (earning pennies!) so will be making every minute count! It seems you've stumbled across my little corner of the internet my beloved wee IonaBlog... I'm Iona a blue-haired, Media graduate living in London; who's rather partial to shopping, social networking, working all the hours under the sun and the odd cocktail or two (or three). Raise a toast to 2013 with Toffee Apple Martinis!